TIP: DreamFactory virtual machines and cloud images already have Postfix mail server installed. It is possible to send emails from Postfix, but it is not recommended to send emails from the server itself. 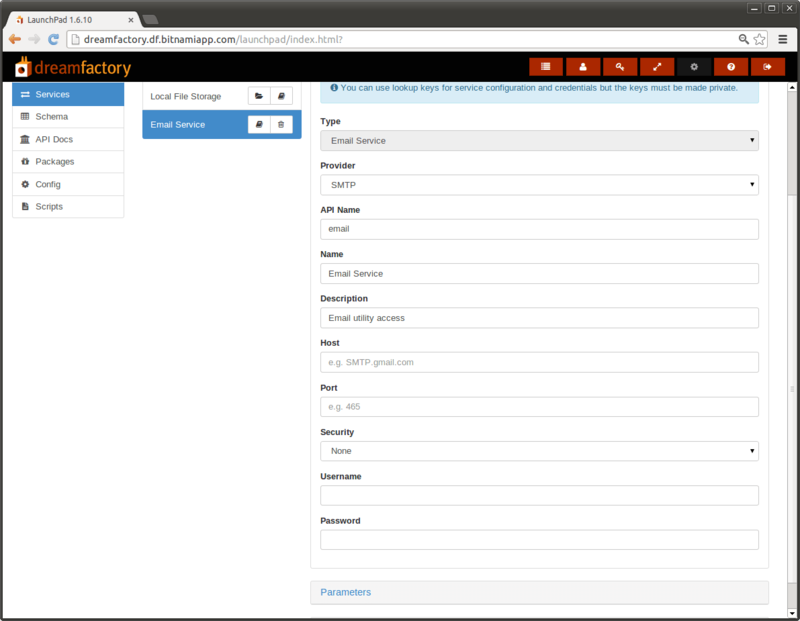 We recommend configuring the “Email” service in the DreamFactory administration panel to send emails through SMTP. Navigate to “Services -> Email Service”, select the “SMTP” provider and configure it according to your SMTP credentials. For instance, here is an example of configuring SMTP settings to send emails through a Gmail account. Replace USERNAME and PASSWORD with your Gmail account username and password respectively. Edit the /opt/bitnami/apps/dreamfactory/htdocs/.env file and configure the SMTP options. For example, to configure a Gmail account, use the settings below. Replace USERNAME and PASSWORD with your Gmail account username and password respectively.